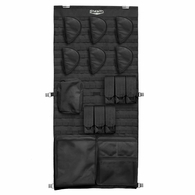 Gun Safe Door Organizers & Storage Panels - On Sale, Ships Today! "Chances are your safe is full to the brim. Using a door organizer in your safe will free up so much shelf space that you'll instantly want to go out and buy more stuff to put in that empty space! These panels hang off the inside of your gun safe's door and are a quick and easy fix to a very common problem. CALL 818-899-2222 & Make Sure it Will Fit!" Looking for more than just door organizers? 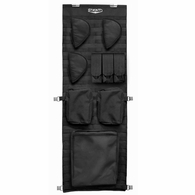 Check out all of our Gun Safe Accessories! There is a door organizer available for any kind of gun safe. While some panels are specific to certain manufacturers or models, many may be used on other types of safes as well. Other hangers are generic in that they can be used on any safe. The point is that there is definitely one that will work for you! But please make sure to measure the inside width of your safe door, as well as the height, to determine which storage panel will fit your gun safe's door. Liberty makes a door organizer in six different sizes. 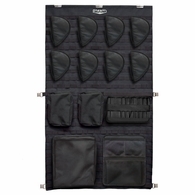 Each size includes holsters and mesh and zippered pockets. All of the Liberty organizers (except the size 12) even have a thermal-lined zippered pocket (the "Cool Pocket") for added fire protection. The Liberty Accessory Door Panel Size 12 measures approximately 10 inches wide by 50 inches tall, and usually fits a 12 cubic foot safe. Liberty's Accessory Door Panel 17 measures approx. 17 inches wide by 46 inches tall. This is a good size for a 17 cubic foot safe. If your safe is in the 20 to 25 cubic foot range, the Door Accessory Panel 20-23-25 should do the job for you. It measures approximately 18 inches wide by 48 inches tall. Larger safes in the 35 to 50 cubic foot range have a few choices. The Accessory Door Panel 35-45 measures approximately 24 inches wide by 49 inches tall. The Accessory Door Panel 48-64 is 24 inches wide by 58 inches tall. And Liberty's Door Accessory Panel 50 measures approximately 27 inches wide by 58 inches tall. Amsec's new premium door kit is now available in three sizes; the Model 13 , the Model 19 and Model 28. They even have a strap extension kit to expand the panel either in height or width, or both. This will ensure that the door organizer should fit just about any size safe. Cannon's door panel pistol kit is designed specifically for a Cannon gun safe. There are two slots cut in the interior steel door frame where this door panel is attached by clips. Unless your safe has these slots cut in the steel, this kit will not be the right choice for you. Two generic door panels made by Stack-On will work on any safe. Once again, please make sure to measure your door width to clarify which will fit. The smaller Stack-On door kit measures eight inches wide by 30 inches tall, and the larger Stack-On door kit measures 17 inches wide by 30 inches tall.